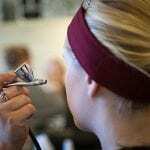 Home » Resources » What Is Best Makeup For Acne? Acne prone skin is always subject or breakouts and occasional scars that will cause you to feel uncomfortable especially if you are to attend an important event. This is why you need to make sure that you are using the best type of makeup that will provide the best coverage. If you are wondering whether you need to use airbrush makeup for acne prone skin then you need to keep on reading. Airbrush makeup is the latest makeup trend and professional makeup artists promise that you will always get the best and most reliable results by wearing it to different events. But should we use traditional or airbrush makeup for acne prone skin? Airbrush makeup uses water based or silicon based makeup. This means that it is basically lighter in consistency than regular and traditional makeup that is usually more oily and heavier especially on acne prone skin. Airbrush makeup is applied using an airbrush gun that uses a compressor and this means that there will be a very thin layer covering your skin and blending perfectly with your pores. This means that there will be less pores clogging and you will avoid having more breakouts. Airbrush makeup is applied using a machine and this means that there is no contamination. Traditional makeup is applied using a brush or a sponge. You might even use your own fingers to blend the makeup but this is not the case with airbrush makeup where the product you are using doesn’t touch any other surface other than your skin. You will not use a tool that will touch the acne on your face and spread the infection to other parts. This means that airbrush makeup for acne prone skin can actually lead to less inflammation and contamination. Does airbrush makeup cover acne? Yes, especially if a skilful makeup artist is applying it using the best airbrush gun. The airbrush gun can be used to spray a very thin and fine layer that will cover everything completely and the speed and consistency of application can be adjusted to suit your different needs. Airbrush makeup is lighter on the skin and this means that your skin will not be irritated by too many chemicals and many layers of makeup that will not allow your complexion to breathe. Airbrush makeup can be applied in a thin layer or a thicker one depending on the skin type and your makeup requirements. It can be heavily applied if you want a flawless look that will cover every pimple and scar you have without looking cakey or heavy. The best airbrush makeup for acne should be heavy enough to cover the skin imperfections but would still be light for a natural and photoshopped look under different lights. Airbrush makeup might be a greater and more appropriate option for acne prone skin because it won’t clog your pores or make your break out since it is lighter. It is usually waterproof and this means that it will last longer even in harsh conditions. We think that airbrush makeup for acne prone skin will give you a more consistent and more polished look without using tons of products and without looking overdone. 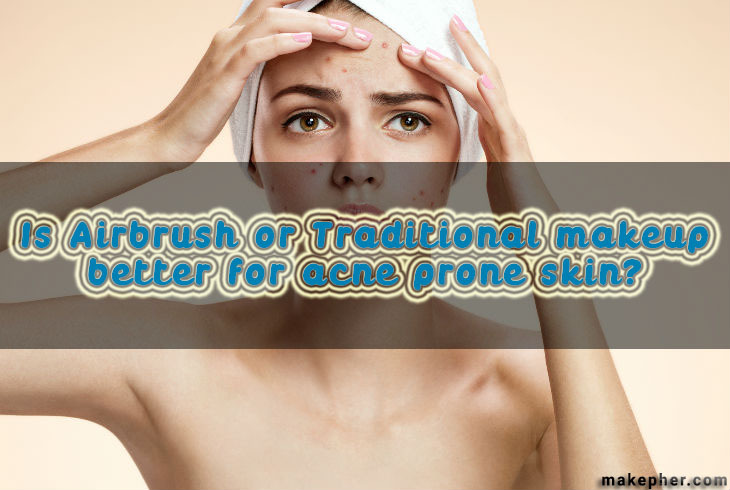 If you have a acne prone skin then knowing how to treat acne prone skin is also very crucial.